Brisbane 4/5/17 to Hobart 12/23/18. Jeannie meets her Aussie cousin Jim. Peaceful fall in Broken Bay. Since arriving in Brisbane in early April 2017 we have been coastal cruising in the southern summer months and returning to Chicago for our summer. 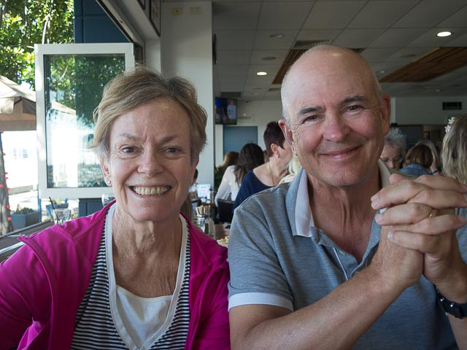 The Australian highlights have been exploring the deep secluded coves in Broken Bay; experiencing the energy and creativity of Sydney's Vivid Festival and Art Biennale; and meeting new friends including Richard and Mary Owens and Jim, Jeannie's cousin, and Fiona Igoe. The Great Barrier Reef in the north is off our path because cyclones frequent those waters during the months we are here. After we paid Australian Border Patrol $ 480 to remove non-Australian farm products and certify that our aluminum boat had no infected timber, we sailed a half day north to join our friends from Port Lincoln days, Brian and Eva Oldfield, for our (Brian's sixty-fourth and my seventy-first) April 6th birthday lunch. 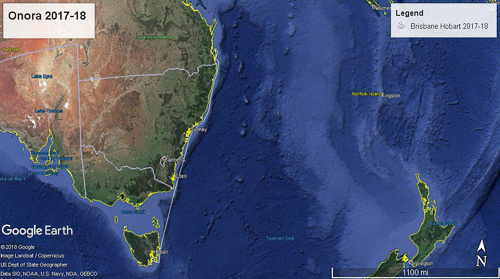 We discussed our Australian plans and cruising options in light of customs, age and desire. Customs had surprised us at check-in. Onora had to leave in two years instead of our expected three and could not come back for three years after. While we had been in New Zealand for two years our Australian customs clock had not been reset-just suspended. The year we had spent in Australia in 2014 still counted on Onora's three-year duty-free ledger. Staying longer would incur a 10% tax on the value of Onora. For the first time age has become a factor in our sailing plans. I have passed seventy and Jeannie is unsuccessfully ignoring its approach. As far as I know there is no marina with nursing care but we have not been to the Philippines. Some day we will have to give this up and each year comes with a few new aches and pains. The other factor, haunting fresh in Jeannie's mind, was our Tasman crossing. My dream of following McArthur hopping up the islands to Japan and casting off for the Aleutians was carried away on Cyclone Debbie's tail. We needed a new plan. Jeannie wants to visit Hawaii so I suggested that, instead of flying, we sail by way of Tasmania, New Zealand and Tahiti - no rush, arrive in 2020. This has become our new soft plan. In mid-April 2017 we left Onora at The Boat Works, Australia's Greatest Boatyard and flew home from Brisbane. A big year waited back in Chicago. After thirty-six years I was more of a drag than a contributor at The Dickson Company and it was time to sell. Even though I had only been its president for a short time in the 1990's it was part of me and the people who made it such a great small company were my friends. Selling made business sense but the six-month sales process was draining on me and harder on the managers. On April 6th, my seventy-second birthday, after intense but civil negations, a five-minute phone call at high noon with principals, lawyers and bankers, ended when the banks agreed to fund and the wire transfers began. I hung up the phone in stunned silence. I am happy with the Chicago-based private equity firm that purchased Dickson. They want to see it grow and respect the people. They have been fair and very easy to deal with in the loose ends that always come with these transactions. Three days later we boarded Air New Zealand. 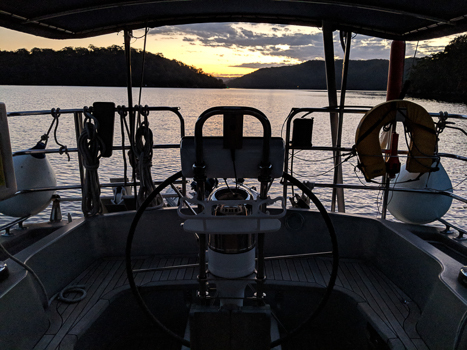 In thirty hours were back on Onora in Newcastle, Australia. We soon left for three weeks of fall anchorages in almost deserted Broken Bay blessed by two national parks and poor phone coverage.